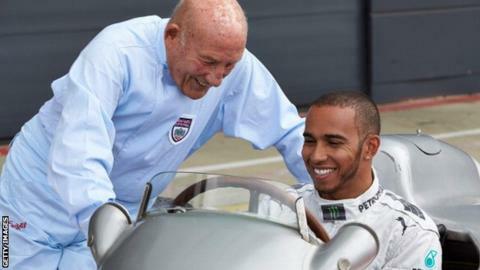 Lewis Hamilton is capable of winning up to six Formula 1 world championship titles in his career, says former driver Sir Stirling Moss. Hamilton recorded his 32nd grand prix success on Sunday which saw him overtake Nigel Mansell as the all-time British record holder for race wins. "I can't see any reason why he can't get four or five or six championships," Moss told BBC Radio 5 live. "He is as good as we've got, and we're very lucky to have him." Moss, 85, is widely regarded as the greatest driver never to win a world title. He came closest in 1958, when he lost out to Ferrari's Mike Hawthorn by a single point, despite winning four races to his rival's one that season. Moss added: "Hamilton looks to be unassailable, quite frankly. He's up with Jimmy Clark, and people like that." The late Jim Clark won two championship titles in 1963 and 1965, as well as 25 grand prix races, the fourth highest of any British driver. But Moss believes 2008 champion Hamilton, 29, will move even further clear at the top of the all-time British standings. "He is that good," he said. "The cars are that reliable these days, therefore one can judge a man by his talent - his enormous talent. He's exciting to watch."